An artist's depiction of Earth's magnetic field deflecting high-energy protons from the sun four billion years ago. Note: The relative sizes of the Earth and Sun, as well as the distances between the two bodies, are not drawn to scale. Credit: Graphic by Michael Osadciw/University of Rochester. John Tarduno, a geophysicist at the University of Rochester and a leading expert on Earth's magnetic field, and his team of researchers say they believe the Earth's magnetic field is at least four billion years old. "A strong magnetic field provides a shield for the atmosphere," said Tarduno, "This is important for the preservation of habitable conditions on Earth." Earth's magnetic field protects the atmosphere from solar winds—streams of charged particles shooting from the Sun. The magnetic field helps prevent the solar winds from stripping away the atmosphere and water, which make life on the planet possible. 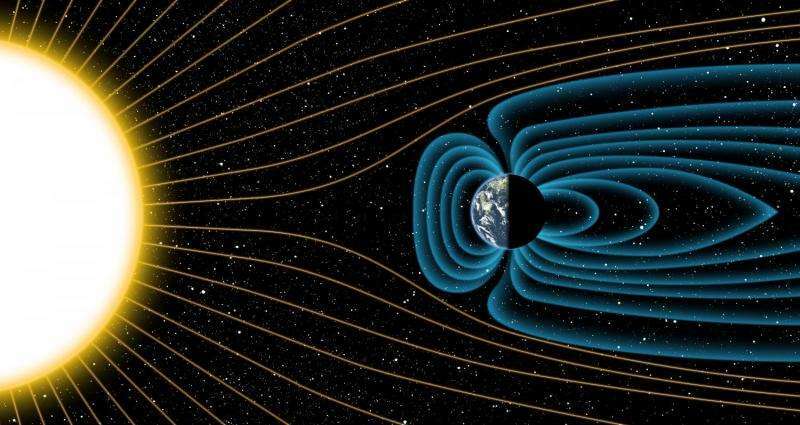 Earth's magnetic field is generated in its liquid iron core, and this "geodynamo" requires a regular release of heat from the planet to operate. Today, that heat release is aided by plate tectonics, which efficiently transfers heat from the deep interior of the planet to the surface. But, according to Tarduno, the time of origin of plate tectonics is hotly debated, with some scientists arguing that Earth lacked a magnetic field during its youth. Fortunately for scientists, there are minerals—such as magnetite—that lock in the magnetic field record at the time the minerals cooled from their molten state. The oldest available minerals can tell scientists the direction and the intensity of the field at the earliest periods of Earth's history. In order to get reliable measurements, it's crucial that the minerals obtained by scientists are pristine and never reached a sufficient heat level that would have allowed the old magnetic information within the minerals to reset to the magnetic field of the later time. Tarduno's new results are based on the record of magnetic field strength fixed within magnetite found within zircon crystals collected from the Jack Hills of Western Australia. The zircons were formed over more than a billion years and have come to rest in an ancient sedimentary deposit. By sampling zircons of different age, the history of the magnetic field can be determined. But in order for today's magnetic intensity readings of the magnetite to reveal the actual conditions of that era, the researchers needed to make sure the magnetite within the zircon remained pristine from the time of formation. Of particular concern was a period some 2.6 billion years ago during which temperatures in the rocks of the Jack Hills reached 475?C. Under those conditions, it was possible that the magnetic information recorded in the zircons would have been erased and replaced by a new, younger recording of Earth's magnetic field. "We know the zircons have not been moved relative to each other from the time they were deposited," said Tarduno. "As a result, if the magnetic information in the zircons had been erased and re-recorded, the magnetic directions would have all been identical." The intensity measurements reveal a great deal about the presence of a geodynamo at the Earth's core. Tarduno explains that solar winds could interact with the Earth's atmosphere to create a small magnetic field, even in the absence of a core dynamo. Under those circumstances, he calculates that the maximum strength of a magnetic field would be 0.6 uT (micro-Teslas). The values measured by Tarduno and his team were much greater than 0.6 ?T, indicating the presence of a geodynamo at the core of the planet, as well as suggesting the existence of the plate tectonics needed to release the built-up heat. "There has been no consensus among scientists on when plate tectonics began," said Tarduno. "Our measurements, however, support some previous geochemical measurements on ancient zircons that suggest an age of 4.4 billion years." "It may also be a major reason why Mars was unable to sustain life," said Tarduno. But then I realized that 3.45 billion would leave the earth unshielded for 1.12 billion years, while 4.4 billion leaves it unshielded for only 0.13 billion, which is an ~8x difference. So I wouldn't blame UofR - the author of the paper was justifiable emphasizing the difference. while the poor wording appears to have come from the headline writer not realizing that "is much older" is not the same as "formed much earlier". Today is really jampacked with nice achievements. Earlier zircon put oceans and continental crust @ 4.4 billion years ago. And now this. Putting late plate tectonic theories under tension is a good day! There are theories for mechanisms that put plate tectonics as early in some form (agglomerated island chains from ocean crust subduction; breaking up of large crustal plates) or other (subduction). @ogg_ogg: No hyperbole as previous commenters show. The unshielded atmosphere may or may not have been a problem. Cf Venus, that has a massive atmossphere without modern geodynamo, but also massive loss of oxygen. The difference can have been that Venus hit a massive greenhouse runaway, cooked its oceans and halted its geodynamo (and plate tectonics). Little temp diff means little convection (and a thick crust). Eventually the water was lost from the upper atmosphere by UV dissociation and hydrogen loss. But having a strong geodynamo on Earth is not a given protector early on. The Moon had a strong initial geodynamo too and was close. Possibly Earth lost a lot of early hydrogen when the magnetic fields tangled, which led to the near neutral CO2 atmosphere we know we had most of the time before the atmosphere oxygenation. Mars does have a magnetic field measured at 1.5 nanotesla, 3000x less than Earth's 50 microtesla and oddly restricted to its southern hemisphere. The statement: Mars has no structured magnetic field is a common misconception. Lets not forget the recent discoveries regarding Mercury and its magnetic field age. Surely that has some input too. I think Venus was smacked very hard early in its life. The fact of its rotation being retrograde indicates the type of collision it suffered. High velocity crash at low angle stopped and slightly reversed its rotation and possibly changed its orbit. Could have happened from two major directions within angular limits in six degrees of freedom.